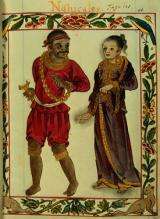 A Tagalog couple of the Maginoo caste depicted in the 16th century Boxer Codex. Image credit: Wikipedia. (PhysOrg.com) -- It has been a contentious issue for some time among historians, anthropologists, and archaeologists whether societies and cultures arise slowly or in sudden bursts and if they collapse in the same way. Now researchers using the tools of evolutionary biology instead of anthropology have created an evolutionary tree of political forms in the Pacific Islands and concluded that cultures evolve towards higher complexity by a slow process of incremental steps, but may take larger steps towards lower complexity. Researchers from University College, London, Thomas Currie and Ruth Mace, said the debate about how complex societies evolve has continued "largely in the absence of rigorous, quantitative tests," and their study aimed to fill this gap. The classical theory is one of slowly evolving levels of complex social hierarchy in societies, beginning with egalitarian bands of related people, and evolving into larger, egalitarian tribes with informal leaders, and then chiefdoms of clusters of tribes with hereditary leaders. These further evolved into states with associated administrative and bureaucratic offices. Other scientists dispute the theory, saying that the evolution is not gradual but occurs in rapid bursts, with bands, tribes, chiefdoms and states all representing evolutionary trajectories and not stages in a linear evolutionary process. They say there is also a movement from higher to lower complexity in societies that the classical theory underestimates. The new research, published in the journal Nature today, focuses on Austronesia, which is the general name for Pacific islands settled by people who left Taiwan around 5,200 years ago. Their descendants spread from island to island throughout much of Oceania and southeast Asia, from Easter Island to Madagascar. As the settlers spread out their language bifurcated repeatedly, and local forms appeared that in some cases still remain today. Currie, Mace and colleagues studied the available archaeological and language data for 84 societies in this Austronesian-speaking group and used phylogenetic methods adapted from evolutionary biology to compare six computer models of their political evolution. In this method societies are seen as branches of a large family tree, like a biological evolutionary tree, but language characteristics are used instead of genetic data. The researchers defined political complexity as the number of layers of local and regional authority in the society, and found examples of a wide range of political organizations, from small egalitarian societies in the Iban of Borneo, simple chiefdoms in Easter Island, more complex chiefdoms in Sumatra and Tahiti, and states such as those of Java. The best-fitting computer model was one in which political complexity rose and fell in a series of small steps, with one layer of authority added or taken away at a time. The second-best fit was a model of sequential increases in complexity, but decreases in complexity that could be sequential or could occur in larger drops. This could happen if a society collapsed altogether, for example, or if a breakaway group started a simpler colony elsewhere. Currie said there are parallels between biological and social evolution, with a tendency towards increased complexity, and with competition playing an important role. Their results show that non-sequential, big jumps in increasing complexity did not occur during the evolution of the Austronesian societies, and the steps forward were small and incremental. The team concluded this could be because of a psychology more adapted to life in small groups, and to the difficulty of reorganizing existing institutions, especially when they are large and involve large numbers of individuals. ah, but biology can evolve within a generation or two....so how accurate can the title be?? I'm sure you are very much like your grandfather Brandon. Societies, like organisms, occasionally change in a generation but, in historical terms, it's exceptional... though I think we are living in such a time driven by the unprecedented advance of technology. Over a century of anthropological investigations into society and culture, and this is the best we seem to be able to come up with; arrogant 19th Century evolutionism countered by equally regressive "scientific models". This is the kind of article that makes one despair. Curb the western superiority complex, spend some time living with the people you purport to study and you;ll soon come to appreciate the awesome complexity of their social worlds, instead of trying to place them on such retarded scales. Over a century of scientific education and this is the best you seem to be able to come up with? Arrogant 19th Century Anti-Evolutionism countered by equally primitive attacks on "scientific models". This is the kind of comment that makes one despair. Curb the anti-scientific superiority complex, spend some time actually learning how to do science, and you'll soon come to appreciate the awesome complexity of their work, instead of trying to dismiss it with such retarded posts.